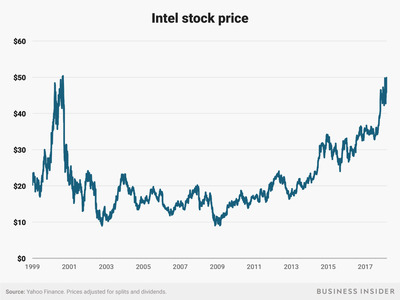 Intel just reached its highest price since August 30, 2000. The stock has struggled to come back in the years since the tech bubble burst – but a massive security meltdown disclosed in January doesn’t seem to be slowing it down. Shares of Intel reached an all-time high of $US51.33 Tuesday, their highest levels since the tech bubble of the early 2000s, despite a recently exposed security flaw that affects every major CPU maker in the world. The stock’s previous high, adjusted for splits and dividends, was $US50.37, set at the closing bell on August 31, 2000 – almost 18 years ago. Intel’s latest gains came off a strong earnings report in January – its first since the Spectre and Meltdown security flaws were publicly exposed – that sent the stock flying as much as 7%. For the fourth quarter of 2017, Intel reported adjusted earnings of $US1.08 per share versus Wall Street estimates of $US0.87 per share, and revenue of $US17.1 billion compared to analysts’ estimates of $US16.34 billion. Intel did not detail the potential financial impacts of the flaws in its report, which seemed to comfort many Wall Street analysts. “We feel better about the security flaws having a more limited impact on business after listening to management’s commentary on the earnings call,” Nomura analyst Romit Shah said in a note following earnings. Wall Street thinks Intel can go even higher, too. Analysts polled by Bloomberg have a consensus target of $US52 for the stock – 4.3% above where shares were trading Tuesday. The company’s first quarter earnings report, its first since the flaws were made public, is set for March 26, 2018.